Test your knack for precision and balance with the Cannonball Drop. How many sticks can you remove before any of the balls fall down? Can you beat the current high score? Will you fare better than your guests and friends? Whatever you’re celebrating, the Cannonball Drop will be the perfect game for the occasion. Have a blast on your birthday, reunion, bridal shower, promotion, graduation celebration, or to spruce up an afternoon. You can also have it even if there’s no special occasion - having a Sunday barbecue? Bored on a Tuesday night? Getting together with friends over at your house? This game will make your time all worthwhile. It’s even better with food, drinks, and company. For just £15, you can hire this game for the whole day! 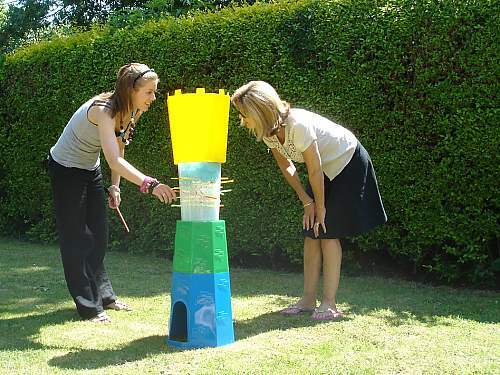 You can pick two options: hire it together with a bouncy castle as a package, or get three individual games from our Garden Games collection. Either way, we promise you’ll have a good time. They’re perfect for kids and adults. You can be assured of quality and safety - all games are regularly inspected and maintained. For more info, you can reach us via the Contact form. You can also phone, or email us at your convenience. Our representatives will get in touch promptly.